Sharp, crisp and super-sensitive response. Warm tone. 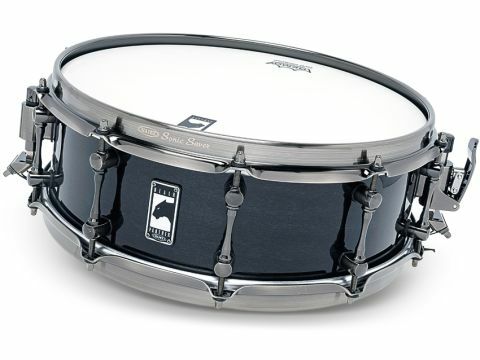 The 14"x5" Black Widow has a thin ply shell, just 5.1mm of maple, finished on the outside in glossy black lacquer through which you can just see the grain. It has matching black chrome hardware. The shell has one of Mapex's new bearing edge profiles, dubbed '5:5', which is a 45 degree slope to a sharp edge with a round-over to the outside. 14"x5" is a neglected size, being 1/2" under the standard 5 1/2". That half an inch less, though, gives the drum a noticeable alacrity. This drum is mighty sharp, you get that lovely sensation of crispness when you tap it - it's super-sensitive all over the batter head. And the SonicSaver hoops accentuate the pin-sharp cross-stick response. The maple bestows brightness and warmth, a fine tone, tempered by the fact the shell is thin, meaning it's resonant and relatively dark. The rounded-over bearing edges warm the tone a fraction.